The SF Chronicle is reporting that the state's department of corrections overstated "jobs saved" by 13,000. And that is just the fake jobs from ONE DEPARTMENT. In a letter sent to leaders at the Capitol on Monday, State Auditor Elaine Howle said that the Department of Corrections and Rehabilitation has overstated by as many as 13,000 the number of jobs saved by federal stimulus dollars. That represents more than 10 percent of the jobs California reported saving with the federal funds. Howle said the department appears to have counted employees who were not at risk of losing their jobs. 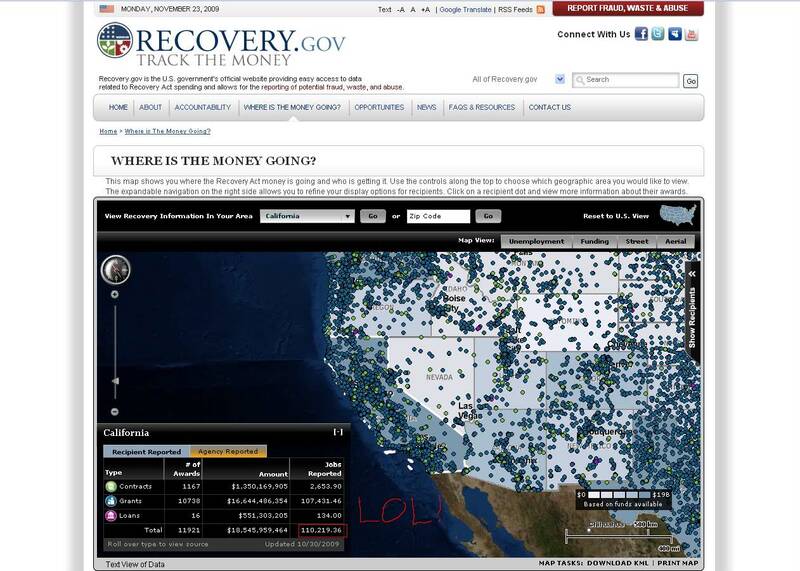 Recovery.gov says that California has seen 110,000 jobs saved by the stimulus. We'll take that down to 97,000, a quick drop of 14%. I wonder if the president still feels that the inability to measure job creation from the stimulus is a "side issue."